I would also like one of these cards when they become available. Would like to sign up for one as well. 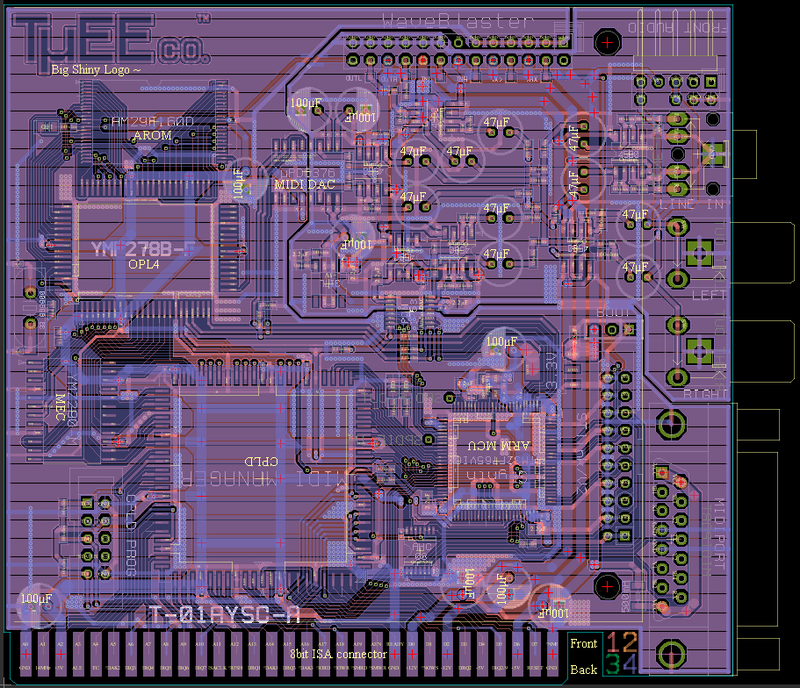 Your design finally does some justice to the capable YMF71x sound chip, compared to the budget PCBs that I have here. There's no formal order page or anything, everything has been via e-mail and PMs. I can tell now that cost is going to be 95€ + shipping. Eventually I'll look more into web side of things and attempt to make an order page (I very much hate web stuff ). Main differences between previous board and this one are that there's RCA outputs, 4 layer board and a larger CPLD with what I can hopefully fix the 486 problem I have experienced. It'll sit as a middleman between ISA and YMF and passes only the right stuff. Hopefully that'll cure all my problems. have you tried one of your cards with the game Dune? All my OPL3-SA cards have an issue with Dune, as the FM music gets currupted, stuck notes and the like. I don't know if this is a specific issue with these cheap card designs, a specific YMF 71x issue or YMF289 OPL3 issue. I don't have a card with separate YMF289 so i can't test. If your design does not have this issue i would like one card. I don't have that game to test the card with (it isn't the type of game I would play). Corrupt sounds on FM indicate too high chip access speed normally. OPL3L in the YMF721 uses ISA wait state generation signal and in theory will exclude too fast access problem. I'll have to look into sourcing the game in some way so that I can make some tests. Is 95 Euros for the card with or without the OPL4? Does the OPL4 do anything worthwhile? It just kind of seems like another run of the mill wavetable add-on to me. It would be a lot more useful if somehow the second OPL3 could be utilised for dual OPL2 support. There are no cards without YMF721 this time, I'm not using my stash for parts (which got exhausted with the prototypes). The YMF721 gives you another OPL3L and an okish MIDI synth. One can still use the WB connector or external MIDI device(s) if desired aswell. The new CPLD may have enough resources left to try to create dual OPL2 setup compatibility, it is something I will attempt to do. Board routing is more or less completed now, time to make it all pretty and add in copper fills. Some feature creep happened and IDE connector is a bit more useful now (it can be either primary or secondary) and there's a boot ROM socket for something like XTIDE (I will not be populating it and configuration is all soldering based aswell, it isn't going to be a feature that gets much use). I have also reduced PCB under the gameport, I have one board that has socketed keyboard controller and the edge gets in the way on it (plus the brackets came out about 1mm lower than they should so it is a win-win). Board routing and checking is all completely done, aaaand I cannot get anything until Feb 12 due to the Chinese new year. At least I have time to work on the CPLD and make any changes to its pinout in case of some compilation inefficiency due to proximity issues of relevant signals. I have discovered that the YMF721 chips my friend got me are duds, they have different chips inside them (and no clue what they actually are). I've notified my friend and we'll figure out how to proceed. I also discovered that fundamental mode 33.8688MHz crystals still need 3.9Kohm bias resistor on the oscillator rather than 1Mohm with YMF71x. That's strange, I wonder why your YMF721 chips don't work, remarked chips maybe? The board looks great, I'm definitely interested in getting one when they're ready. They're definitely remarked but that is something I see all the time, mostly to refresh the date codes for whatever reason... but always the chips have been real stuff. But this time I have something useless, and they weren't exactly cheap either. I did FM and digital music recordings from the T-04YBSC-A. The clarity is marvelous. Can't wait to see what the 05 can do PM me if you have requests for recordings! Fake parts problem isn't yet sorted out, but I have began to work on a solution that involves STM32 MCU that will be able to act as a synthesizer, I'm working on a small expermientation card where I can get comfy with ARM. Moreover due to these delays I actually cannot afford to start the new run since rent has eaten the funds and continues to do so. Few smaller side projects have to take over such as TB60XG. I am also in the process of moving and that delays things further, by end of March I should be settled in the new place and things would be returning toward normal again soon hopefully. Hello, I would like also to sign up on a waiting list if possible. INTEREST IN 1 CARD DECLARED. Ready to pay when you get things sorted out (if you haven't already). Thanks for such an amazing project Tiido!! !